There are many churches that we can still admire in Venice, but we can no longer see San Geminiano, a church of great artistic and architectural heritage that has had many vicissitudes, having been destroyed and rebuilt several times in the course of history. It was a building with a very elegant façade, that now we can see only in some prints and paintings of the time. This church was in Piazza San Marco, on the opposite side to the Basilica, and served as an architectural element of conjunction between the Procuratie Nuove and the Procuratie Vecchie (the Procuratie are those long porches surrounding Piazza San Marco, which take their name from the fact that the upper floors were the lodgings of the Procurators of San Marco). In the area occupied by the last church of San Geminiano there was previously another church dedicated to the same saint, built in the sixth century (between 554 and 564), together with the church of San Teodoro, that were both given to Venice as a gift by the Byzantine general Narses for the help given by the Venetians at the siege of Ravenna. According to historians, it is not clear if the first church of San Geminiano was destroyed by a fire in 976 or in a series of fires, earthquakes and seaquakes that occurred in Venice in 1106 and that also caused damages to the Basilica and the adjacent Palazzo Ducale. 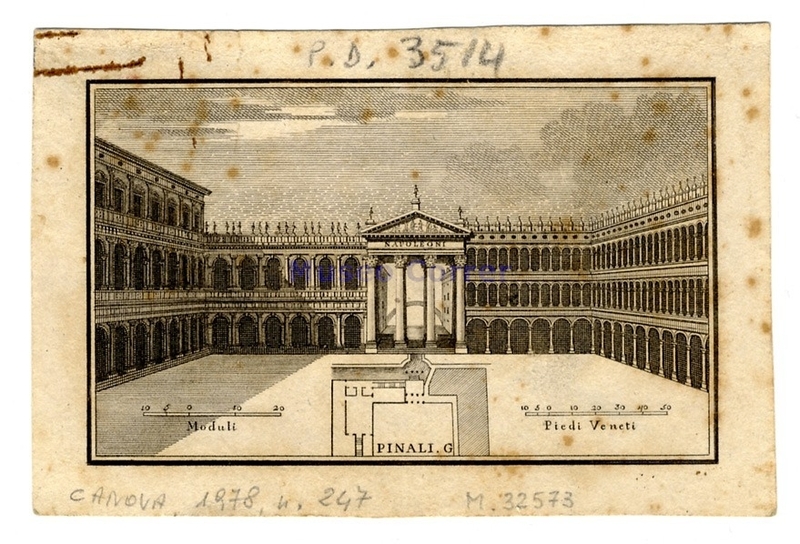 The church was however immediately rebuilt, and subsequently demolished and built again by Cristoforo del Legname in 1505 and later restored by Jacopo Sansovino in 1557, who gave it its final look. 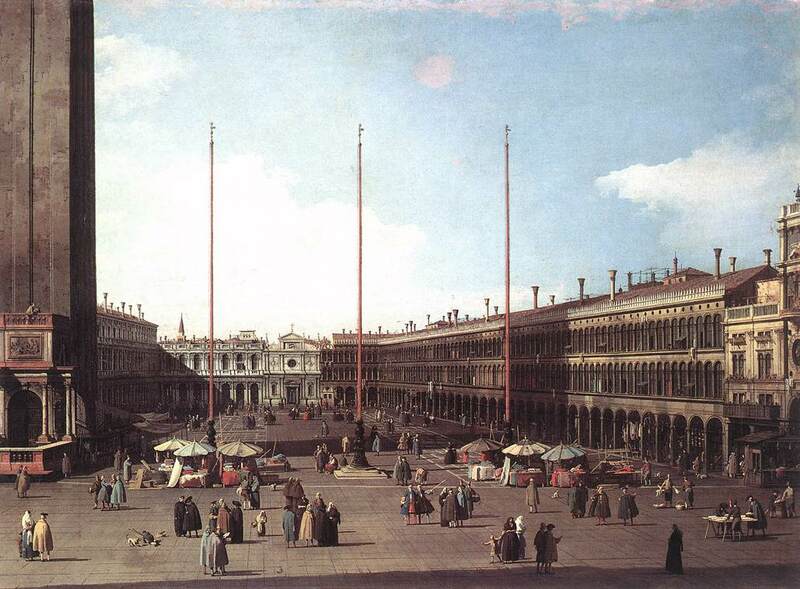 Although small, it was among the most decorated churches of Venice and displayed a large number of works of art. From the journals and letters of the various travellers and writers who were lucky enough to visit this church, we know that it contained works by Jacopo Tintoretto, Veronese, Gerolamo Santacroce, Giuseppe Scolari, Ludovico Spinelli, Alvise dal Friso, Gerolamo Brusaferro, Sebastiano Ricci, Gregorio Lazzarini and Bartolomeo Vivarini. 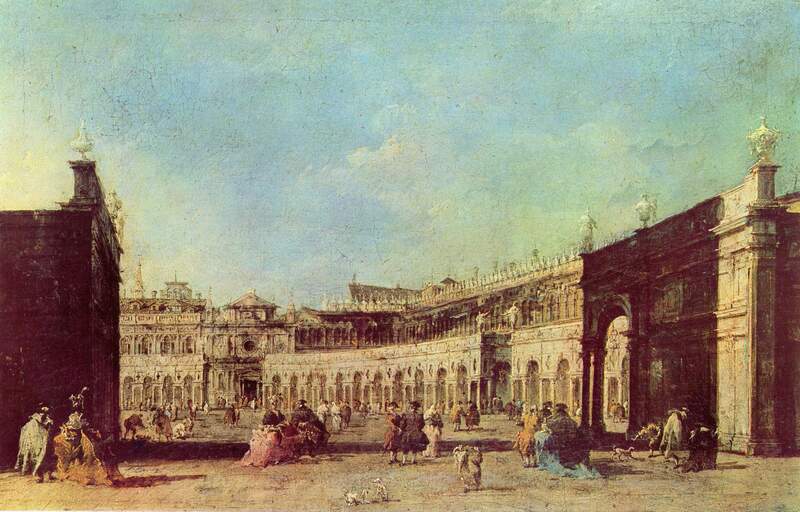 According to critics, however, despite the presence of works of art of the greatest masters of the time, the importance of the church derived from its architecture. 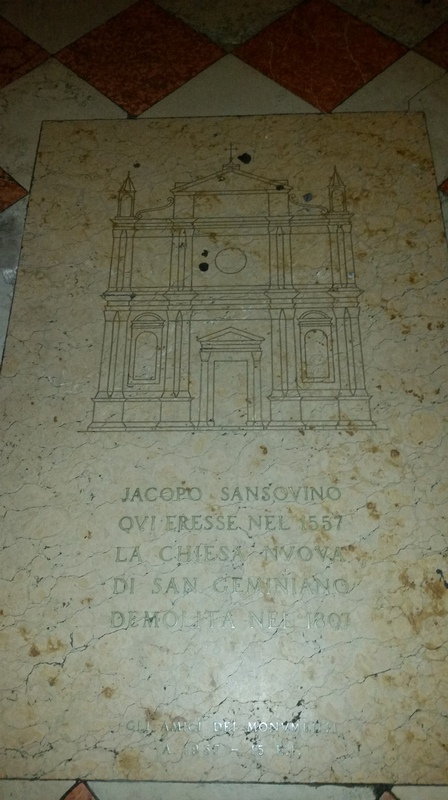 Its beautiful proportions and stylistic choices fitted perfectly with the surroundings, to the point that the same Sansovino chose an adjacent chapel as his burial place. Unfortunately, the French government that occupied the city was not preservation-minded and decided to demolish the church to make room for the Napoleonic wing, now part of the Museo Correr. Napoleon wanted to build a stateroom and a staircase suitable for the building, which according to his plans, would be used by the Viceroy Eugene Beauharnais and Napoleon himself when they were in Venice. 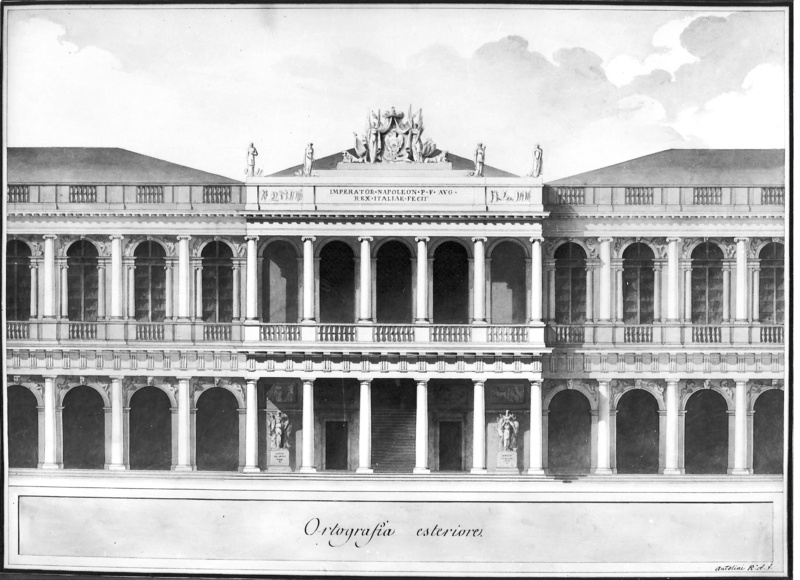 The demolition began on 19 May 1807 and the project of the new building was given to the royal architect Giovanni Antolini. The works of art inside the church followed different paths: some were dispersed between Italy and other countries, while others were placed in other churches. 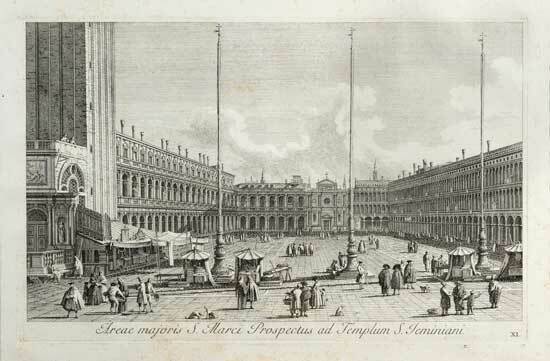 Now, the body of Saint Geminiano is buried inside the Oratorio del Nome di Gesù, while the ashes of Sansovino are kept inside the Basilica of San Marco.